Nestled between the verdant Shangri-La of Hyde Park, alongside the historic streets of London’s affluent Mayfair, the Dillian Whyte vs. Joseph Parker press conference takes place within sumptuous-interiors of the luxuriously-extravagant, prestigious and five-star, Dorchester Hotel. The Dorchester, a lavish and opulent resort that’s elegantly dipped in modern-day hospitable-commercial chattel, lush trimmings and embellishments, yet still engraved and resonating with a 1930s polished-ambient gleam. A fancy place that advocates and indulges the swanky-hankerings and plush appetites of glamorous A-listers, such as the “way back when” Hollywood sweethearts, Richard Burton and Elizabeth Taylor; the comedic genius that was Peter Sellers, legendary-iconic band, The Rolling Stones, as well as slew of glitzy modern-day, popular culture contemporaries. Amidst the brash decor and furnishings, flashing illuminations and erratic machine-gunning profusion of media cameras; Whyte and Parker reside at opposite ends of the press table, comfortably exchanging civilised pleasantries along with the odd professional-amiable threat, while money-hungry promoters Eddie Hearn and David Higgins endorse and grease the conceptualised wheels of this unofficial, world heavyweight championship eliminator clash involving their two title-ravenous scrappers. Hearn and Higgins: fundamentally two prolific floggers with two very different personalities and methods, but ultimately one clear objective: to pitch, draw-in and entice the fans of the boxing world with this potentially explosive bout between their two prize fighting heavyweights. Higgins: the straight man of the collaborative outfit, calmly and clinically sets the premise, relevance and allurement of this fight before lauding and championing his fighter’s pugilistic capabilities and physical resilience, while Hearn: the ‘Willy Wonka’ of boxing promoters – the ‘dream-maker’ and ‘dreamer of dreams’, smoothly glamourises and peddles the pay per view fight for all it’s worth – like any good promoter should! Before the conference draws to a close, Whyte and Parker share a friendly face-off – both men deploying a respect and civil courtesy without any pantomime grudges; after all, it’s not like these two heavyweight lions share a raw, white-knuckling hatred for one-another, unlike the genuine distaste and gran-prix paced, middleweight scraps of the 1990’s between Eubank and Benn. However, with its resplendent environment, genial atmosphere and tone, the beginnings of this fight is certainly a far cry from where it finishes: in a gladiator-esque battleground domain that’s embellished with blood, sweat and spit from a brutal and barbaric, gritty 10oz-gloved straightener. A bloodied lustering vignette of a fight, with two heavy-handed, heavyweight boxing-brawlers, raging it out in an explosive toe-to-toe trade of leather. A potential heavyweight classic fight that ignites an electrifying rip-roaring and blood-thirsty crowd, complete with solidly-monstrous, brass-knuckled uppercuts and sledge-hammering hooks rattle against granite chins, snapping back heads as spattering lashes of boiled sweat whip from ‘pissed wet’ crowns. A potentially hard-hitting scrap that thunderously rips through the rounds, as the two heavyweight contenders dish out punishing and devastating powerhouse shots in attempts to render the other man to a battered and bruised, slick-eyed and bloodied-up, canvas-backed state. I feel as though pugilistic intelligence and strategic, chess-like game-plans may not get a chance to come into play with this one; as a vicious and ferocious tear-up is more than likely on the cards. As the saying goes, ‘styles make fights’, and Whyte and Parker’s styles should make this fight a cracker. Resilience, conditioning and a gritty-iron-determination prevails in this contest. So, who has the upper-hand, edge, advantage or hungrier going into the fight? Let’s take an analysis of the two boxers. The 6ft 4″ and 16 stone, former WBO heavyweight champion held an unblemished record of (24-0) until his points defeat to AJ in March this year. Parker: an inside fighting knockout merchant with fast hands, quick feet, resilient-granite chin and the only man on the planet to ever gone the distance with the WBA, WBO, IBA and IBF world heavyweight champion, Anthony Joshua. The New Zealander goes into this tough fight following a loss, however, Jospeh Parker is a hardboiled, confident and rapaciously-title hungry boxer who’s obviously developed a taste for the big-prize fighting bouts and the pay-days to match. A man who’s not to be tangled with, for his combination of speed, brass-knuckled-power, determination and granite-like chin are aspects of his boxing aptitude which present an extremely dangerous threat to Dillian Whyte. However, Parker’s injury to his elbow may hinder him somewhat during this battle. Parker appears to set traps by snapping and firing out quick jabs to stun opponents before he unloads with a clobbering knockout right. If he keeps to the same style and strategy, he may continue to place strain on his elbow and prompt further possible injuries. Dillian ‘the Body Snatcher’ Whyte. At 6ft 4″ and 18 stone, the former British heavyweight champion and current WBC Silver world heavyweight title holder is a bull of a man that configures a solidly-strapping, bulky-muscular physique. A lethal certified stalwart-banger who is equally equipped and capable to dance within the parameters of the sweet science as well as tearing it up in a broiling-brawl. A man whose boxing abilities have certainly slipped a gear or two, as he now displays his sharpened tools with a lot more pugilistic sophistication; exemplified in his last fight with Lucas Browne by producing a wonderful performance, finishing with a chilling knockout that made Browne look as though he’d brought a knife to a gun fight. The self proclaimed ‘King of South London’ nowadays utilisers a more studied fighting intellect and enhanced technique; now carefully picking and deploying his shots rather than blasting out big heavy-power punches that shoot holes through the tank within six rounds. No, Dillian Whyte has consistently progressed since his defeat to Anthony Joshua back in 2015. Now, ‘the Body Snatcher’ is more adeptly furnished, seasoned and ready for the rough, tough challenges ahead. 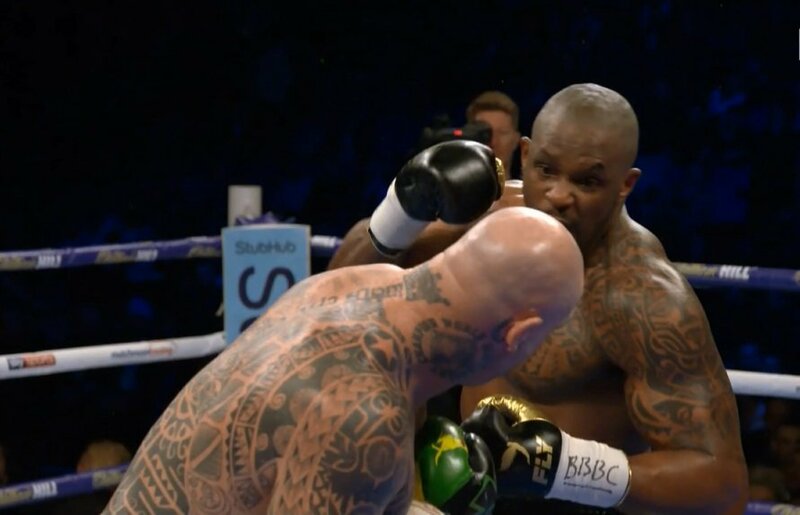 However, the only concern I have for Whyte going into this fight with Parker is his notoriously-flaring blistering temper that’s fixed to a hair trigger. If emotions run high and tempers spill over; it may be the only detriment which could cost him the victory. But, if Whyte controls and channels his aggressions and claims the win; thereafter, I think we may very well see, him challenge and beat Deontay Wilder, which could result in a domestic battle with his old foe, Anthony Joshua. Dillian Whyte may just turn out to be our British heavyweight unification champion. But I guess we’ll see! In conclusion, I believe both men will be entering this match respecting one-another capabilities, but undoubtedly performing with a formidable, jagged-menace, ferocity, grit and relentless iron-valour. Both Dillian and Joseph may have completely different backgrounds and upbringing – Parker: growing up in the suburbs of Auckland and taught how to jab the pads at the age of three by his father, Dempsey, who was named after the great American heavyweight champion, Jack Dempsey. Then we have Whyte: born and raised in a povertal area of Jamaica until the age of twelve with no schooling, only to move to Brixton with his family, seemingly to have swapped one ghetto for another, as he’s previously explained. But the two fighting men do share a will and aspiration to be heavyweight unification champions and to firmly cement a place in the boxing history books . They also know one of them needs to be eliminated from the elite, heavyweight equation in order to get another crack at beating at the man who they both share their only loss to. It’s fair to say, the shared ambitions to be champion of the world courses through their fighting blood – however, by ripping away the crown and taking revenge from the only man who blemishes their records would be all the more sweeter I’m sure. Good luck to both Dillian Whyte and Joseph Parker. May the best man win and both return home safe to their families.